Twelve pounds of locally purchased peaches were processed into 12 liters of pressure canned juice.Cost about $1.50 per pound. 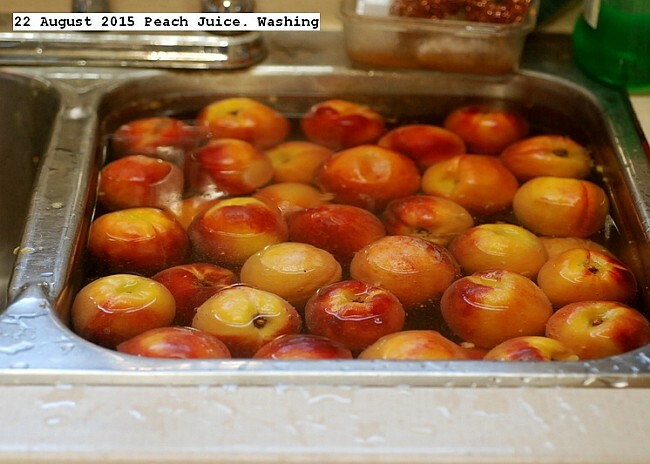 The peaches were washed, pits removed by hand squashing, 6 liters of water added to cooking pot. Cooked until soft about 20 minutes, blended into a slurry, processed through Victorio strainer. The Victorio residue was put through a Champion juicer. The 12 liters of juice was pressure canned in two batches, since pressure cooker holds seven jars, at 15 PSI for 15 minutes for long term storage at room temperature. This entry was posted in Uncategorized and tagged 22 August 2015 Peach Juice, Peach Juice. Bookmark the permalink.